Natural linen, tufted back couch with a French Lime oak wooden frame with padded Bergere arms. 74" long x 22" wide x 37.5" tall. Very sleek Mid-Century Modern sage green couch with wooden trim. Four tapered legs across the front. Long rolled striped pillow across the back is optional or pick from the extensive pillow choices we have. 75" long x 30.5" tall x 32.5" wide. Sage green damask chaise with a rolled back and a two button tuft. Great for bridal or boudoir photos. 29" wide x 59" long. 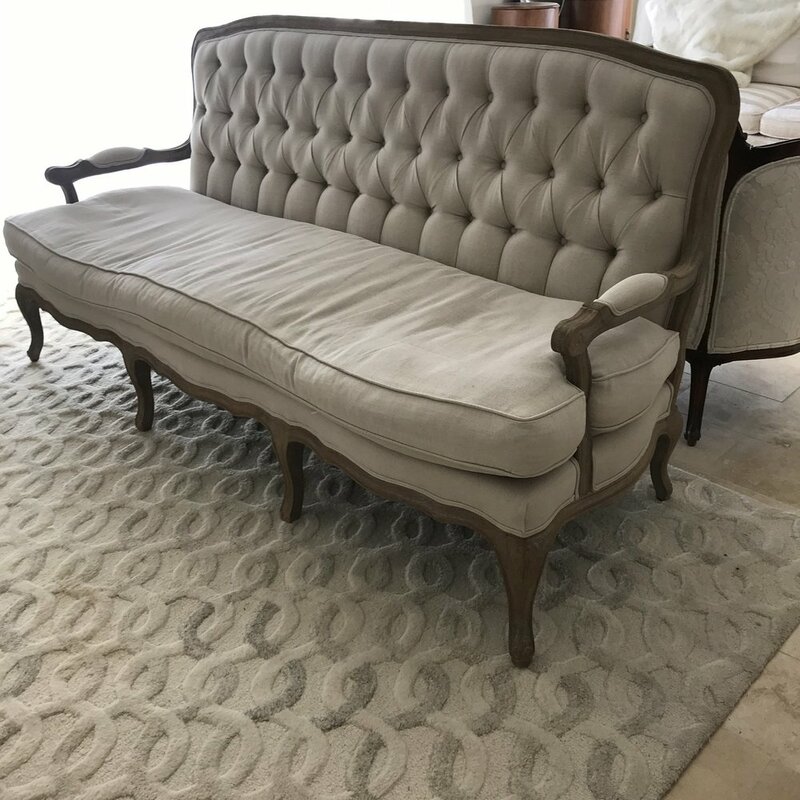 Tufted, rolled back, three cushion, wood trimmed, cream embossed damask couch. French Provincial feet, four in front. 82" long x 36" wide x 33" high. Perfect for lounge areas. True Hollywood Regency style couch. Cream with gold accents, double caning on the sides. Textured cream velvet with a taupe stripe fabric. 72" long x 33" wide x 33" tall. 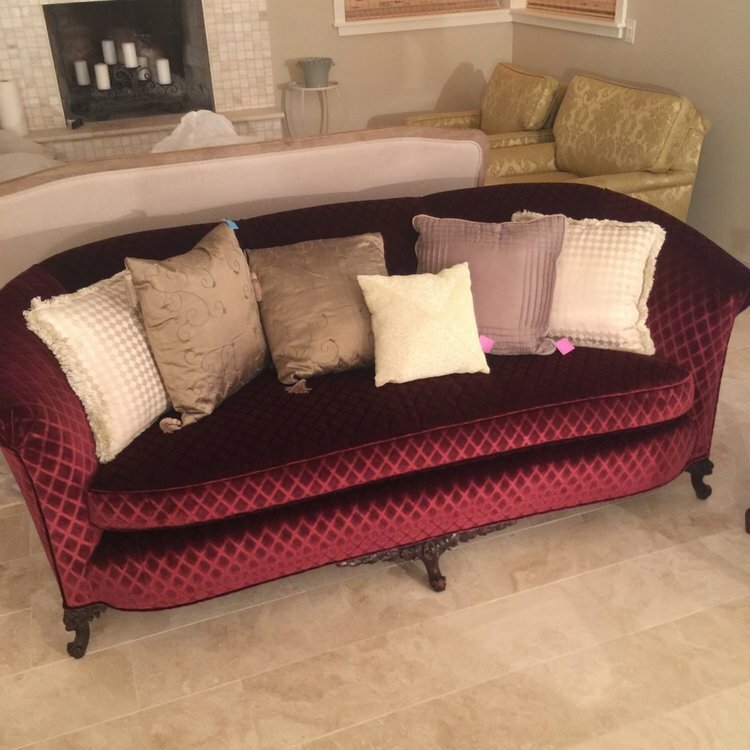 Recently covered in vintage fabric, this couch is Marsala velvet with a diamond pattern. The wood on the bottom has a sculptured pattern on it. It has a camel back with rolled arms. Great piece for photos. So dang cute! 36" wide x 82" long x 28" high. Classic wicker love seat, perfect for two. Add some of our custom pillows for added style. 58" long x 22" wide x 36" high. Tufted cream floral couch with three wide cushions. Sleight curve to the shape. Pairs with The Gabor Sisters. 112" long x 40" wide x 28" high. Seat at 16" high.. Great couch for photo ops. Original vintage Mid-century modern couch. Pulled straight from a house that time forgot. Tufted, single pillow seat, straight legs, rad orange color. Low profile back and arms. 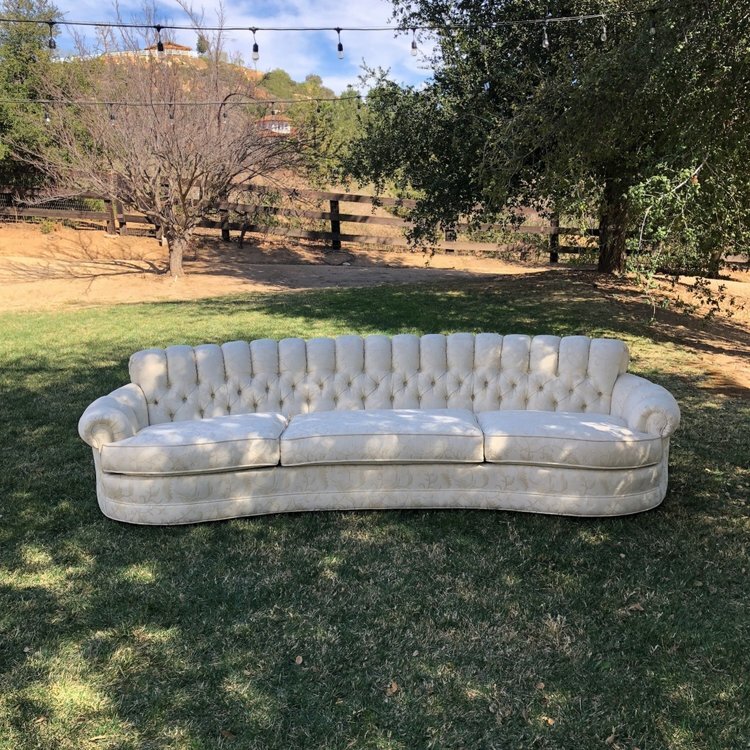 This couch will be a conversation piece at your wedding. 96" Long x 30" wide x 26" high.